Installed 2 tennis courts in Kertih, Terengganu (April 2008). 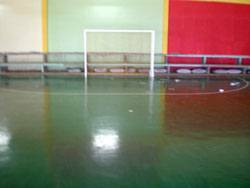 Installed 1 Olymflex Seamless PU Membrane Fibre-Reinforced System Rubberized Futsal Floor in Pasir Mas, Kelantan (April 2008). 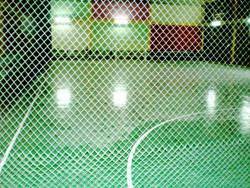 Olymflex Rubberized Futsal court in Pasir Mas, Kelantan. Another view of the Futsal court in Pasir Mas, Kelantan. 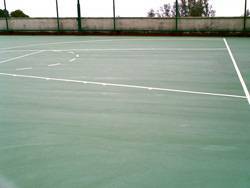 Installed 1 synthetic turf futsal court in Tanah Merah, Kelantan (April 2008). 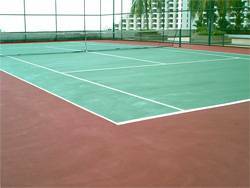 Re-surfaced 1 tennis court and half basketball court for Miami Green condominium in Penang (May 2008). 1 tennis court for Miami Green Condominium, Penang. Half basketball court for Miami Green Condominium. Set up 3 synthetic turf futsal courts in Parit Raja, Johor (June 2008).